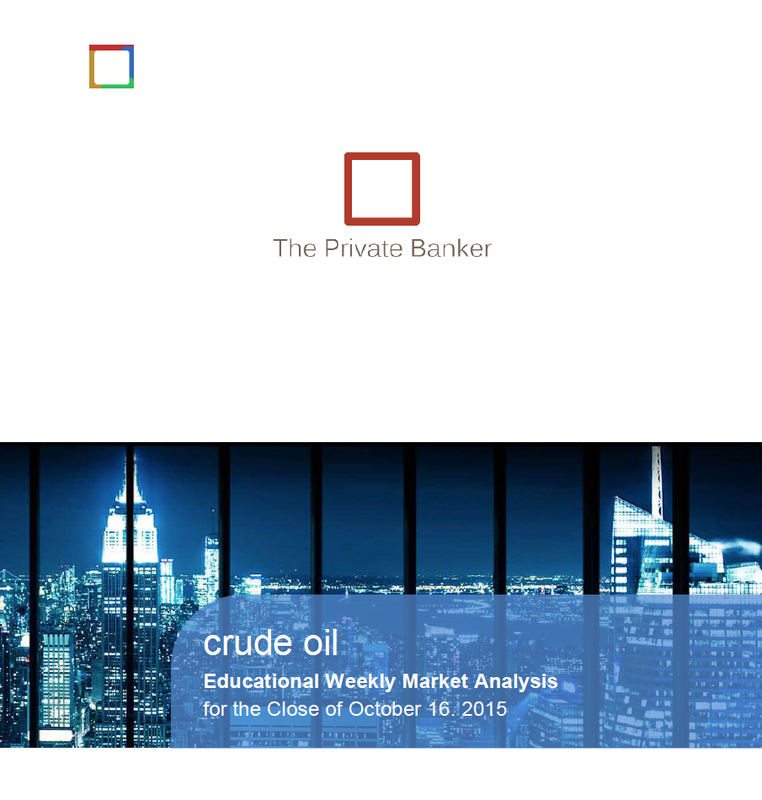 I am pretty excited to announce the new official insights blog for The Private Banker. 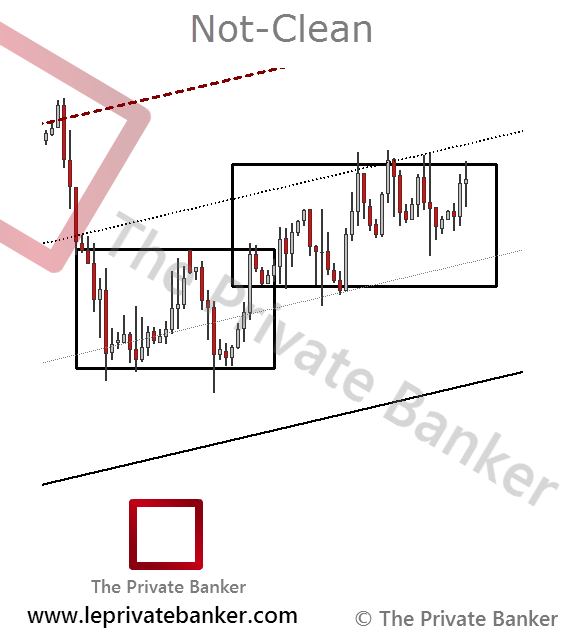 With this new blog I will provide you with some of my stories, experiences and market observations in a more simplified and clean way. In my opinion there are various weird information about trading and other things on the World Wide Web, so I thought to create this blog with the purpose to be a service for the higher good. That said, the new website will be accessible free of charge and I do not wish to display any ads in whatever form there. 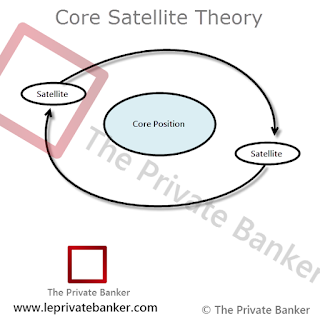 However, my goal is to reach out to like-minded people and grow my network of contacts as well as to expand the community with members who wish to support The Private Banker. I will use this window of opportunity to write research articles, reviews, stories and market observations that hopefully will be of some help for you as it is helpful for me in many ways. With our forum, educational community, the new blog and our lovely twitter feed we are on the right path to give you the most valuable information with the best possible services and products. Also, as technology keeps moving forward the new blog is optimized for mobile devices (Smartphones) for an optimal reading experience. PS: Make sure to subscribe to the new blog via email to keep yourself up to date. 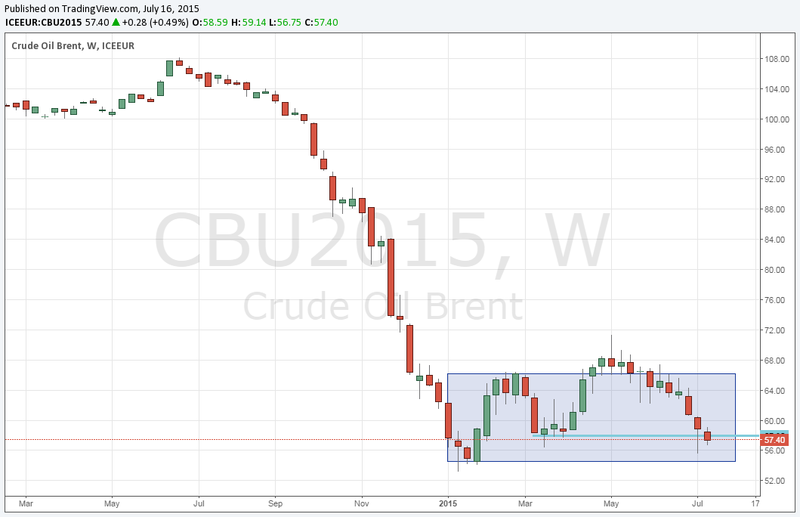 The WTI Crude Oil September contract opened inside of the previous balanced regular trading hours range. 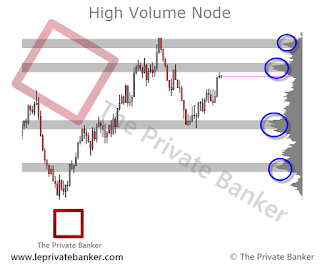 In this particular case with the expectation of a rotational trading session it made sense to trade the range's extrems. 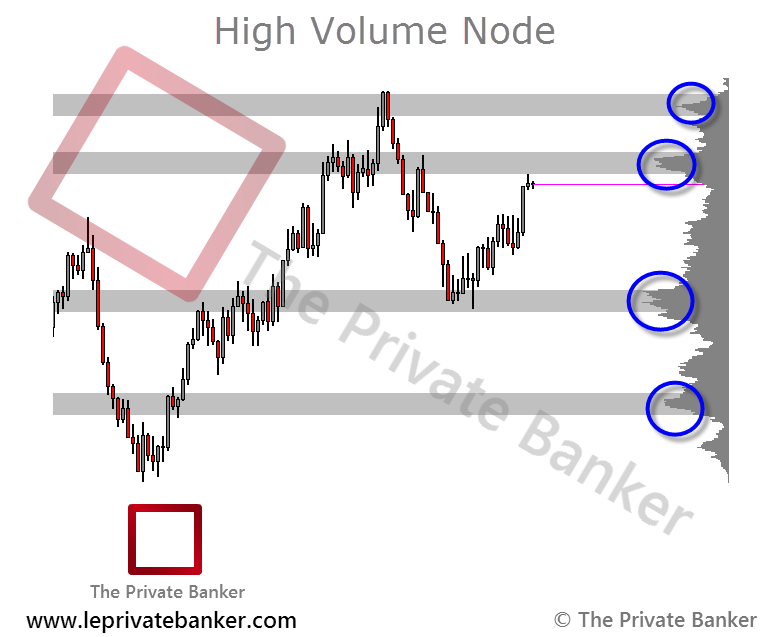 This means to focus on the excess lows or highs for a potential trade to the other side of extreme. 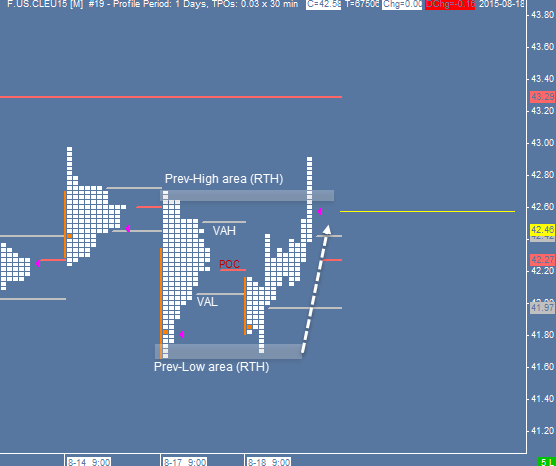 In today's session the market moved in the initial balance phase (first 30 mins of RTH session) to the VAL level and gave us the opportunity to take a long trade as soon the market came back to test the lower extreme, the previous RTH low area. For the rest of the day the market one time framed higher to reach the mentioned target and left us with a nice excess high at the close. 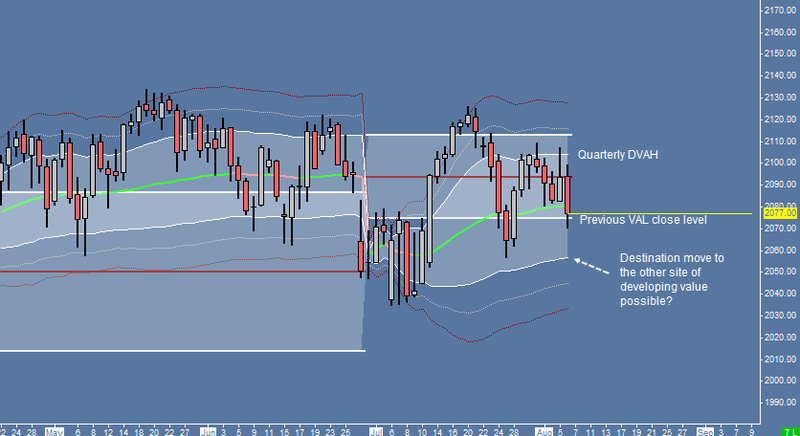 However, with looking at the Yearly and Quarterly VWAP, we can see a one time lower bearish picture. 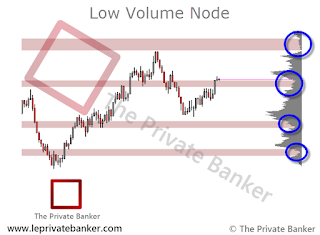 The market is trading in both charts below the developing value and the previous value close areas. 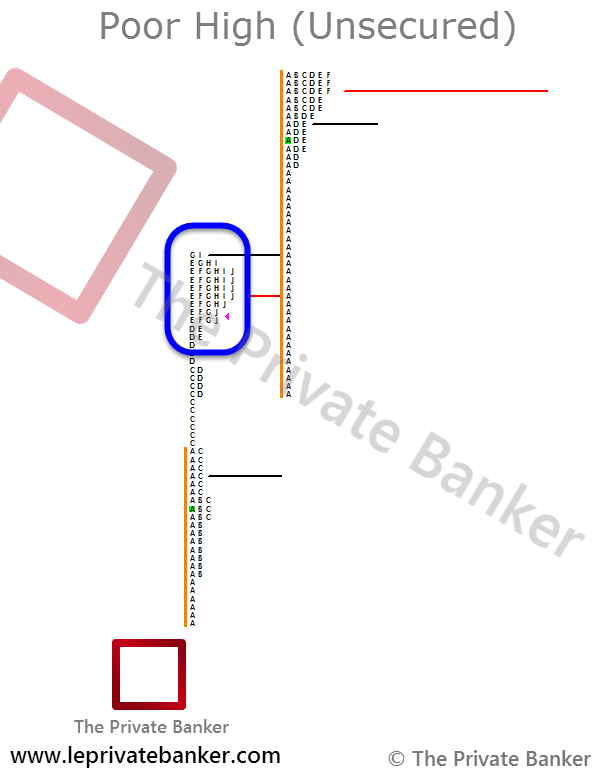 With a closer look we can actually observe that the market trading around the -2nd SD level of this year's developiong VWAP and seems to be supportive for the moment as Monday's session was an inside day. 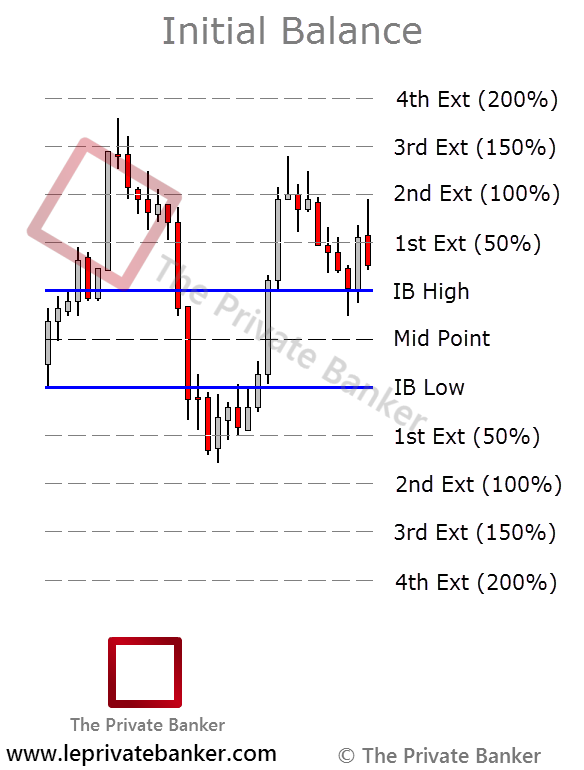 Moving forward to the 240 minutes chart, we marked some potential areas that could supported the long trade for today. Please note: The volume rolled over to the October contract. It could maybe make sense to roll-over our charts to the next contract. We hope you done well today! Have a great day. 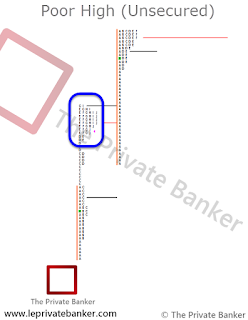 A Buying tail is formed by single prints (single TPOs) at the bottom of a profile. It shows buyers’ reactions to lower advertised prices. 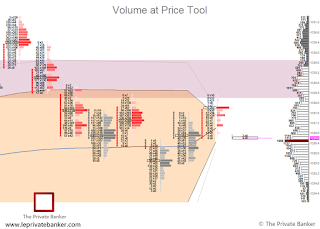 The more single TPOs that form the buying tail the more aggressive the buyers’ reaction. 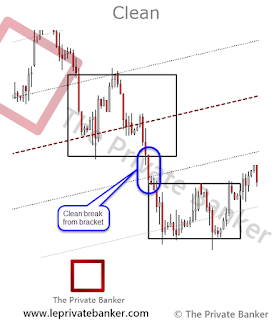 This is a trading glossary term series of blog posts. Check out all the terms we post with the Trading Glossary label. We are excited to announce a change in the Private Banker Membership. We removed the Monthly and Quarterly Membership and made a Yearly Membership available. All members with a active Monthly or Quarterly membership are automatically and without any costs got upgraded to the Yearly Membership. It is our effort to make the valueable information available for a reasonable price and at the same to be able to invest in new educational materails as well as in better website functionalities. - All written and video education content. - Utilize real-time communication features. - Timely Educational Market Analysis Reports. The subscription automatically renew on a rolling 1 year basis*. The subscription support community projects such as new education content, Webinars and philanthropic programs. *There are no partial memberships. Your subscription once paid, will expire upon 1 year. With that said, we hope to see you on our community soon! 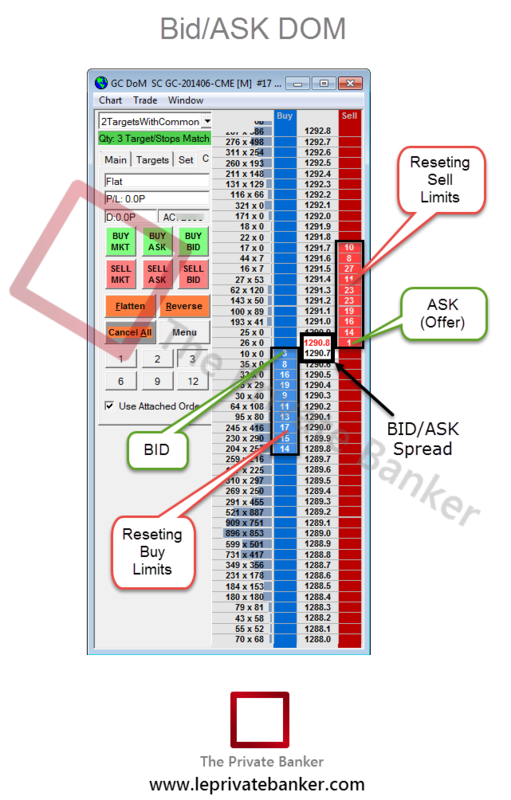 Bid/Ask is the spread the market is trading at between buyers and sellers. 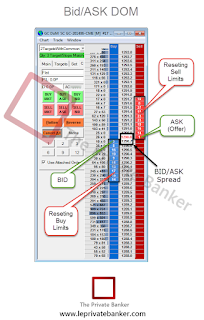 A buy limit order will be executed at the Bid while a Sell Limit order will be executed at the Ask. Market orders are executed at the spread. For example, a Buy Market order will be executed at the Ask and a Sell Market order will be executed at the Bid. The E-Mini S&P 500 September Futures contract opened inside of the previous regular trading hours (RTH) range and value today. 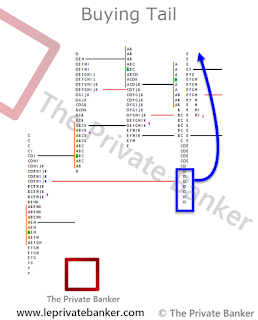 The market rejected the POC, broke the previous low and got selling imbalanced for the rest of the day. 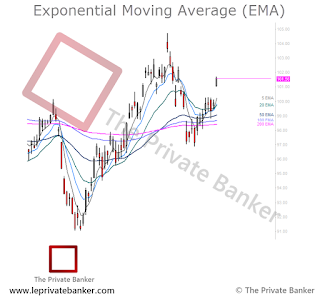 A potential scenario could be a destination move to the Yearly developing value low. Also, to mention is the Quarterly VWAP, with resistance at the DVAH and the down move to the previous Quarterly value area low close level. 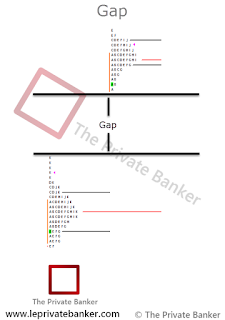 The globex market has been opened directly at the previous VWAP close level. Here is a potential destination move to the Quarterly developing value low possible as well. 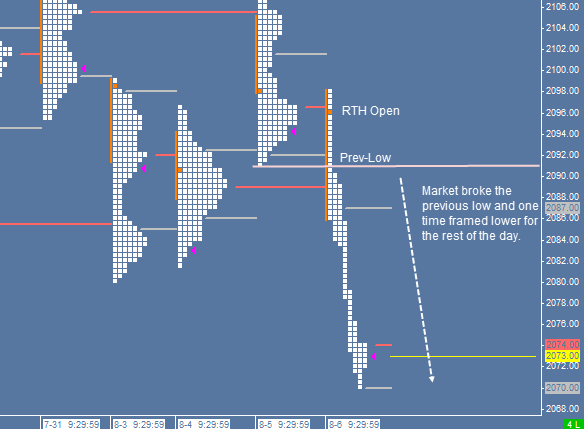 An intra-day short position at the open or as soon as the market broke below the previous RTH-low (in next 30 min TPO period) with a stop inside of the previous value made somewhat sense. The market seems to be balanced with possible support at the mentioned levels (Yearly DVWAP, Quarterly VAL close level, Low Volume Areas). However, a destination move to the other side of the developing value (Quarterly and Yearly) is possible as well. Stay open minded for several potential scenarios. This refers to trading ranges, brackets, balance areas, congestion areas, and consolidation ranges—all synonymous terms. 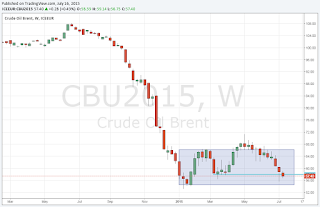 They define price ranges in the market that are containing trade. 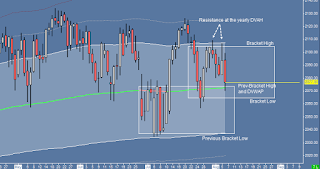 Within these containment ranges reversion to the mean trades are the favorite of short-term traders. 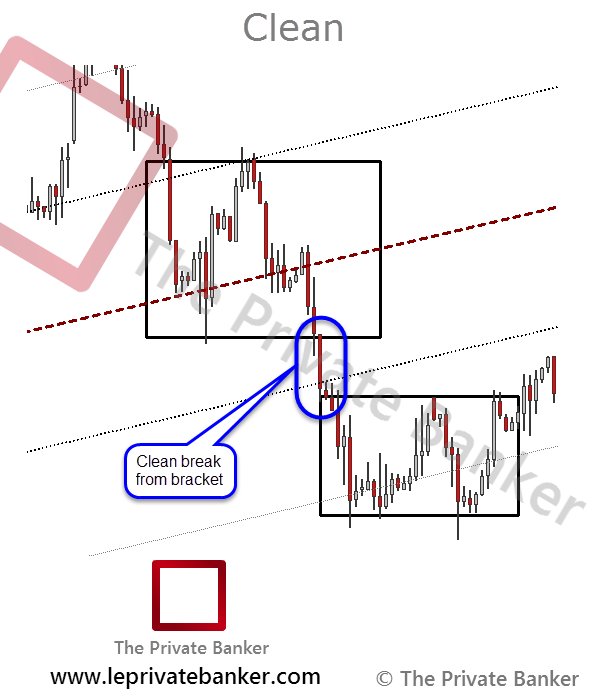 We often refer to these containment ranges as “paradise” for short-term traders. Bigger opportunities occur as price auctions outside of these containment ranges. 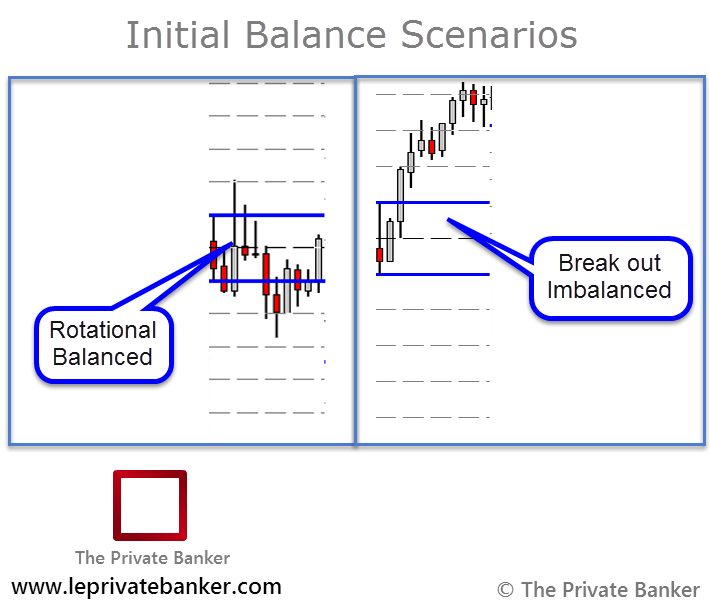 Balance occurs in all timeframes. 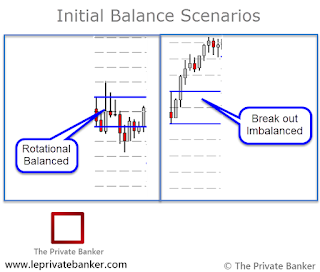 For shorter term or day traders balance may be an inside bar or multiple periods of price containment. Balance and excess are the two most important concepts you will be introduced to because they signify change or the potential for change to take place. 1.Market may slightly extend the range in either direction, stays in balance. Patience is in order. 2.Market explores upside breakout and is met by aggressive sellers; prices fail to be accepted above the breakout. Fade the price probe failure—the potential target is for rotation to the opposite end of balance. 3.Market explores to the upside; higher prices receive the unexpected response and attract even more buyers. Higher prices are accepted, breakout is successful. Go with price acceptance in the direction of breakout. 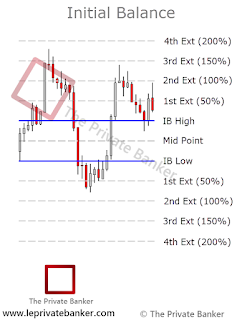 4.Market explores downside breakout and is met by aggressive buyers; prices fail to be accepted below the breakout. 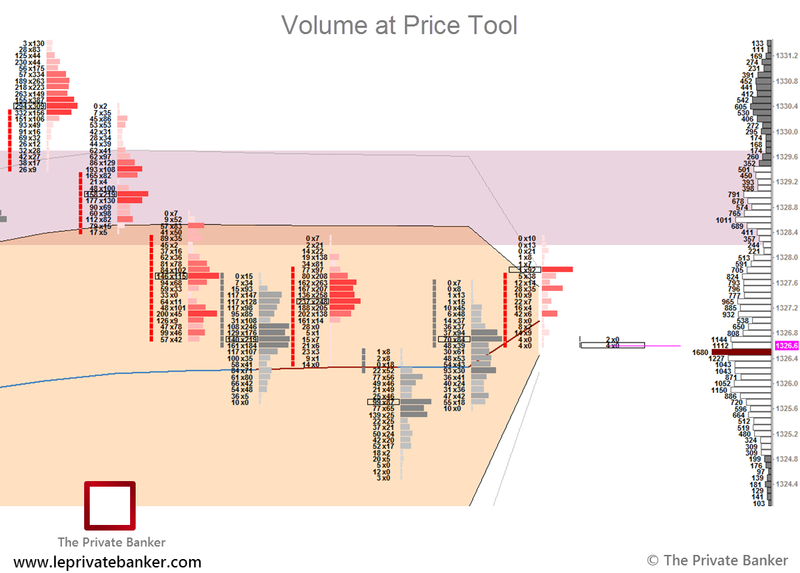 Fade the price probe failure—the potential target is for rotation to the opposite end of balance. 5.Market explores to the downside; lower prices receive the unexpected response and attract even more sellers. Lower prices are accepted, breakout is successful. Go with price acceptance in the direction of breakout. 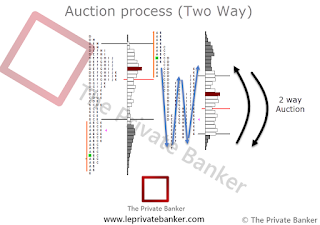 The purpose of an auction is to facilitate trade. Prices constantly auction from low to high and from high to low to fairly distribute the bids and offers presented by the market participants of all timeframes. 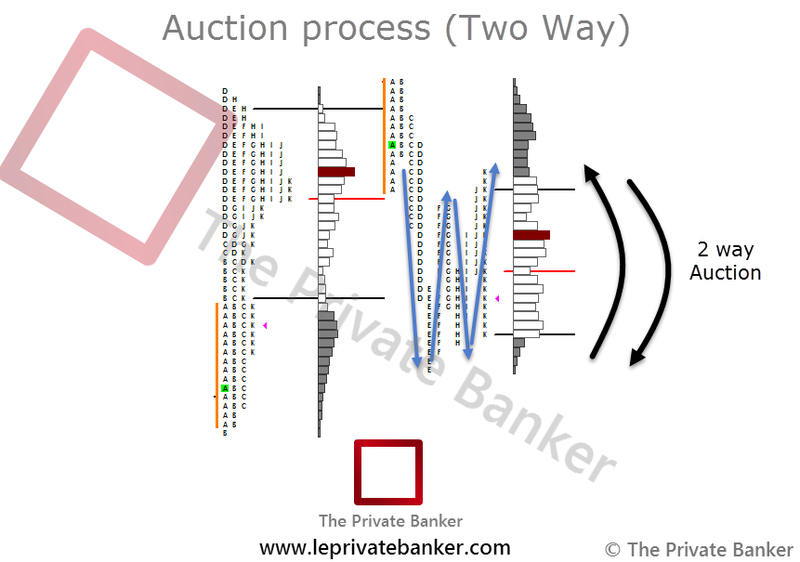 This is the fairest way to allocate prices and contracts among competing bids and offers; the byproduct of the two-way auction process is market-generated information. 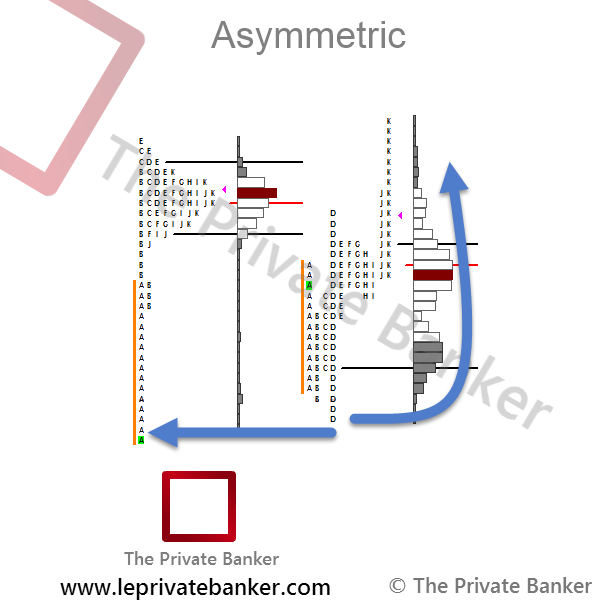 An asymmetric opportunity demonstrates itself when the risk of a trade is skewed positively mutiple times by the profit oppotunity present. 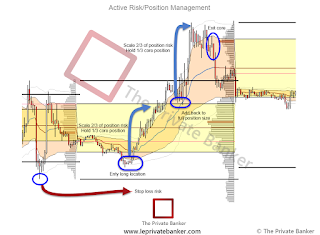 Risk is calculated from a structural stop location in the market which is visual with the Market Profile two-dimensional structure. 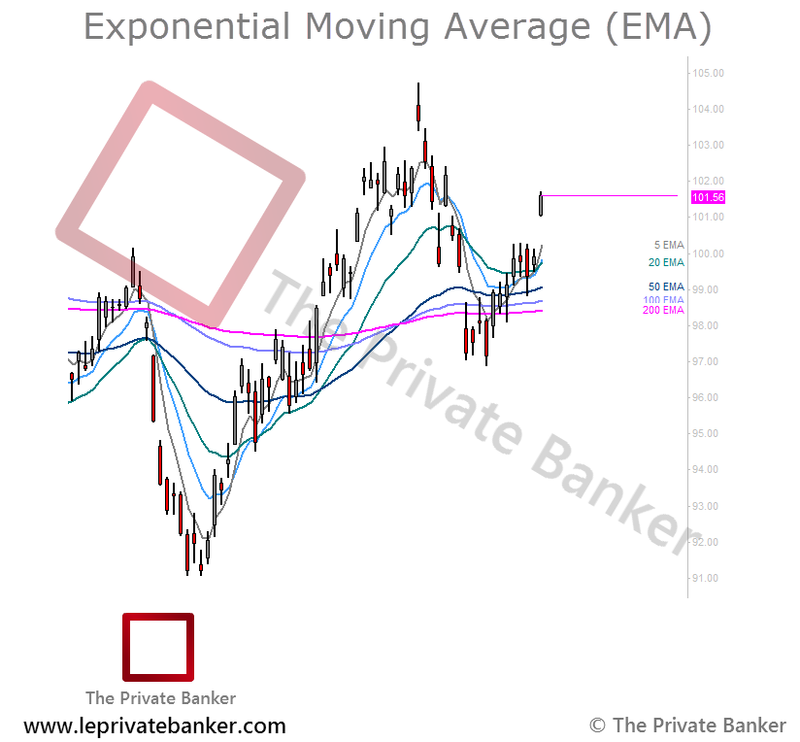 A visual exit location is then used to calculate the potential profit. 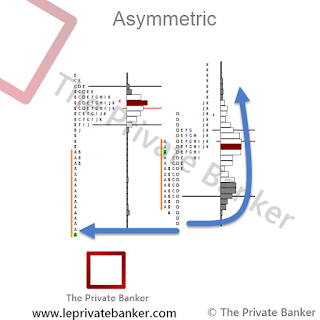 An anomaly is a price level that has no symmetry and abnormal structure in the market profile; they represent weakness in the market TPO structure. 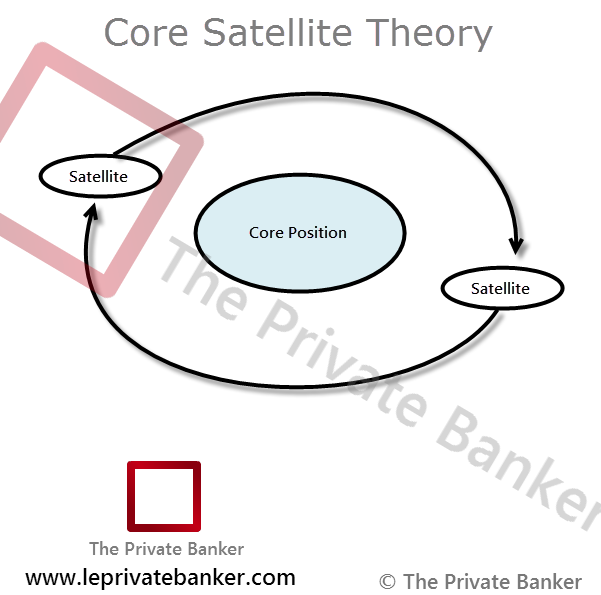 Spotting anomalies is the first step to understanding hidden context in structural development through a TPO profile. 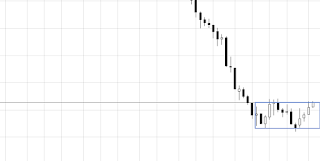 A stronger US dollar as well as the things about the Iranian nuclear deal that would add to oversupply in case this deal may get through Congress seems to give the Brent Crude Oil market pressure to the downside. 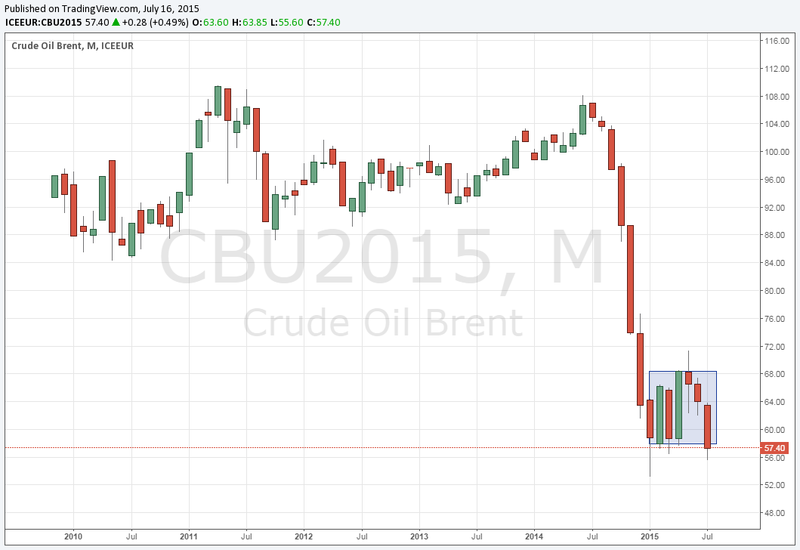 Also a somewhat larger fundamental issue shall be OPEC and its reluctance to reduce output. Furthermore OPEC's production seems to been trending higher in the recent months. All that should add to a weaker market. 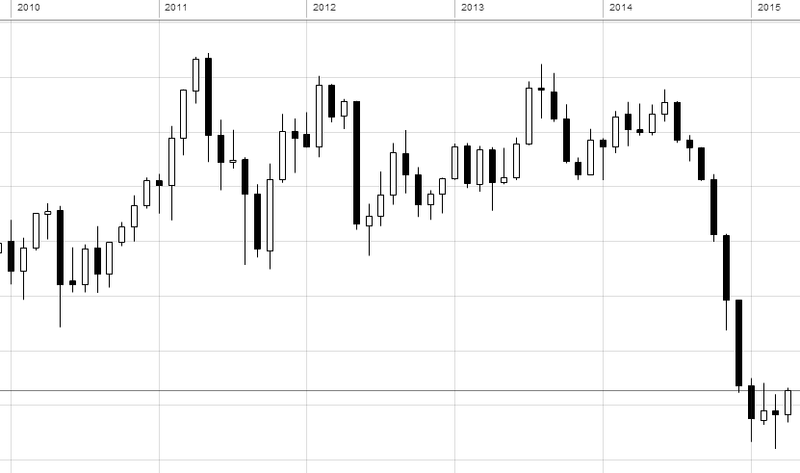 To be noticed is also the expiring August Brent crude oil futures today. 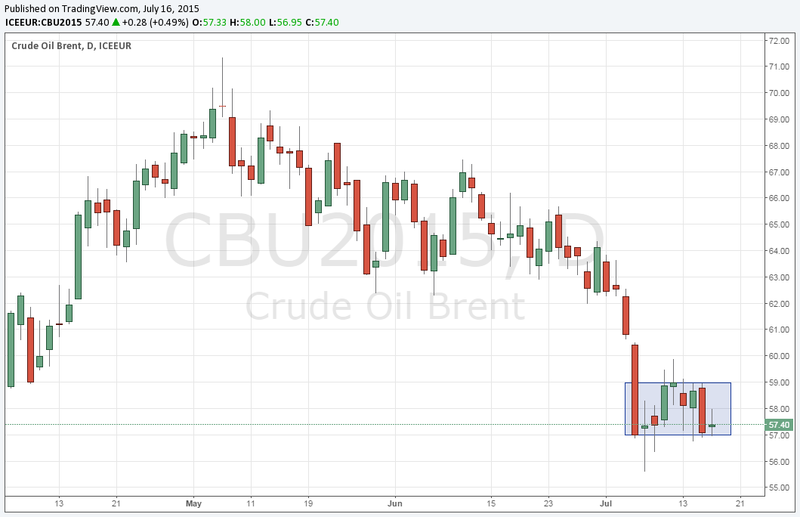 With looking at the monthly perspective of September's Brent crude oil futures contract (ICEEUR), we can see a one time framing lower market inside of a balance area that occurs since serveral months. Currently the market is testing the bracket low, a level to be watched. Moving forward to the weekly timeframe, a one time framing lower market that occuring since several weeks is visible here as well. 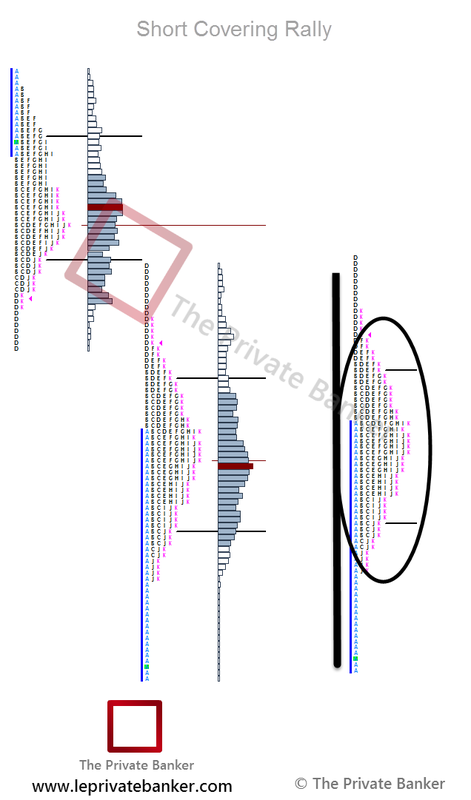 We can also oberve a potential continuing move to the week's balance area low. However, in the previous week we seen some support at the marked level. We'll see how this week's market will react to that particular area. Also, the daily perspective reveals a rotational behavior in the last couple of days with testing the current balance area low. 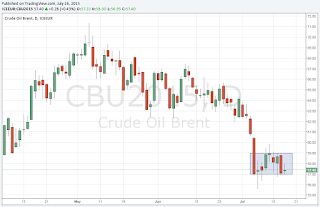 The market could not break Tuesday's low for a potential test of the next supportive level at around $55.60, the low from July 7, to finially see a ongoing one time framing lower market in case trader's are in a short position. Anway, be open minded and stay focused for other possible scenarios. 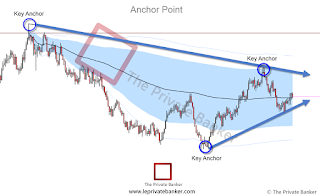 An Anchor is simply a point in which to draw a trend line or VWAP from normally knows as a fractal point. 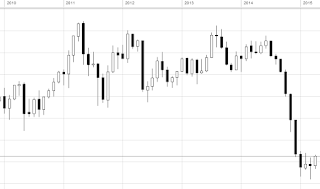 These levels typically represent key events that resulted in a change in the market's perception of value. 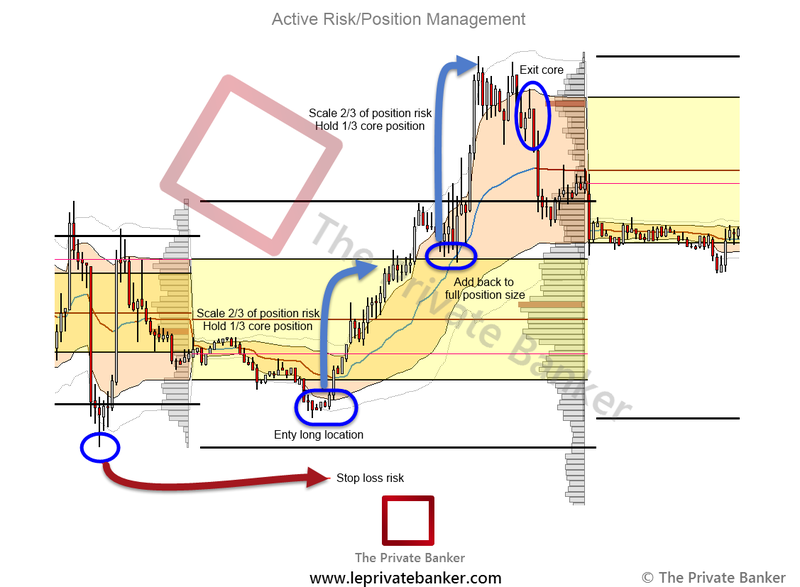 Active Risk/Position Management is achieved through adding and scaling out of a trading position throughout a move. The goal is to eliminate position risk by taking profit on part of a position while the market moves in the desired direction of the trade. By capturing profits, the core position is protected against the market failing to reach the desired target area and stopped out at a loss. 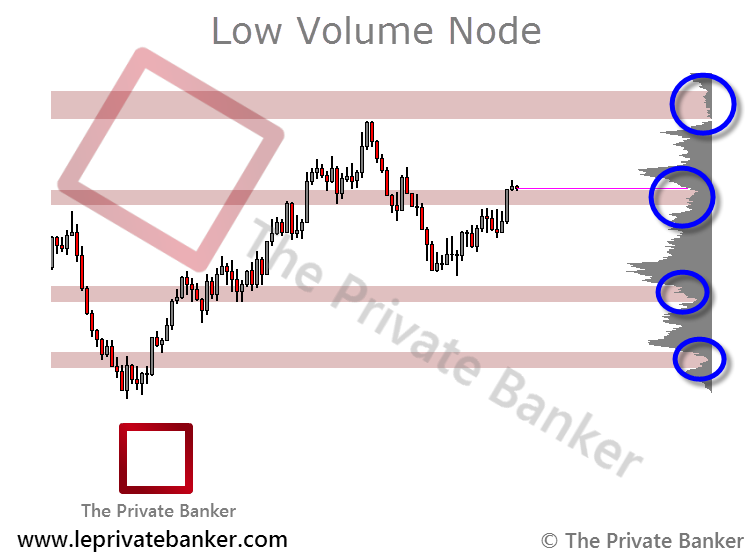 With all the worries about Europe let's take a quick look into the EUR/USD currency pair with our top down analysis aproach on plain candle charts. As usual, we begin with the monthly perspective. With looking at this timeframe, we can see that the market found some balance after a one time framing lower behavior for several months. 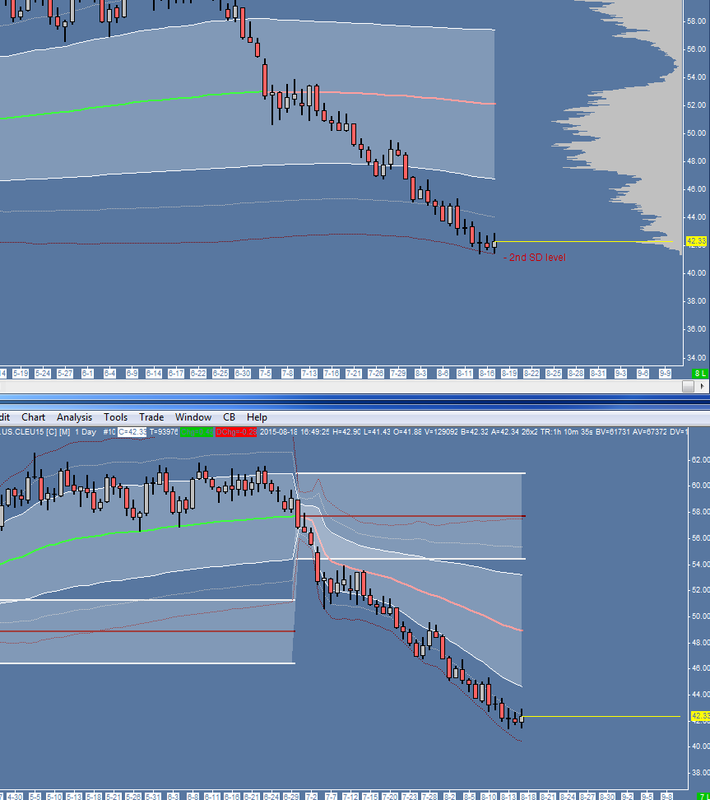 We can see a potential balance area forming here now. The pervious month was an inside month and the current month seem to found some resistance at the possible bracket high. Will we see a move to the bracket low now? We'll see. 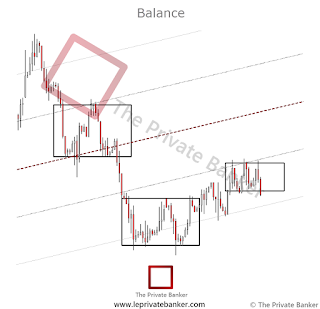 Moving forward to the weekly perspective, we can identify two balance areas. Last week the market found support at the previous bracket high as well as at the current bracket low. Inside of the bracket the market is one time framing lower right now. 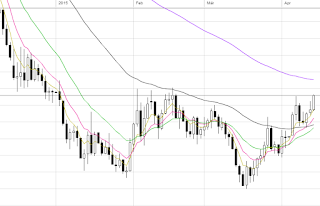 We will observe how the current week will react to this supportive level. Now to the daily timeframe. A lot of nervosity is visible here in our opinion. 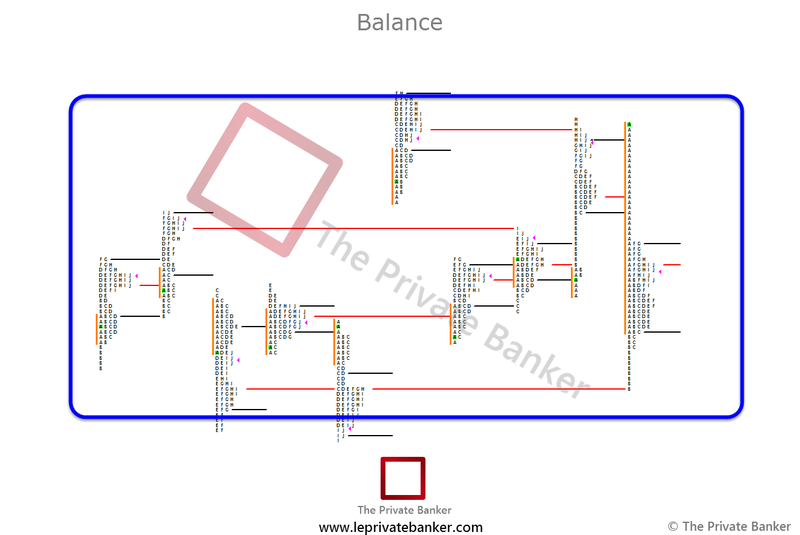 Today we formed a balance area and the bracket low could serve as support now. 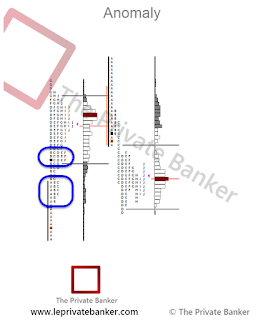 We also marked some more potential support levels if the market would brake below the balance area low. 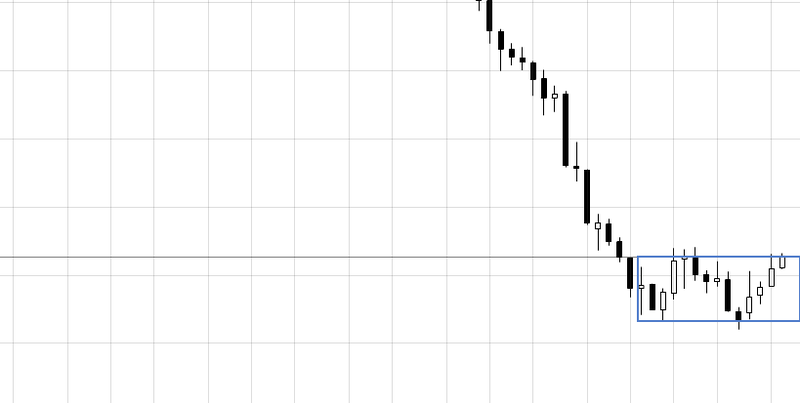 Also, today's market has leaved us with a poor low, that could be a heads up to moving lower here. However, everything is possible here with the political situation in Europe. 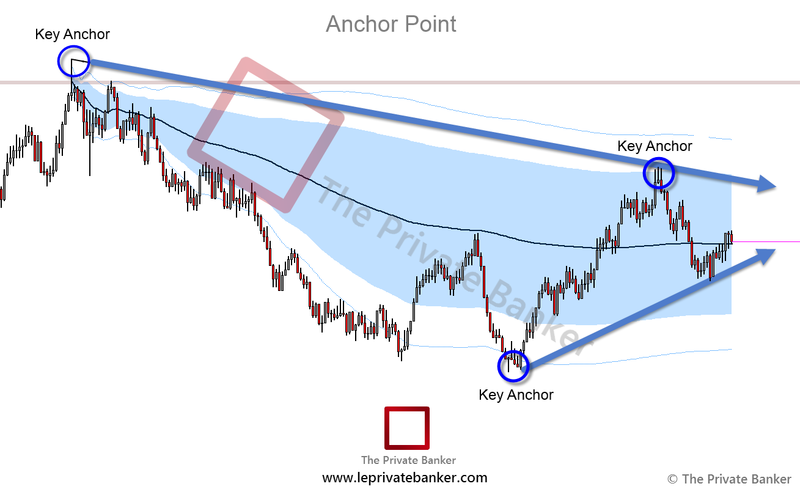 To learn a more indepth analysis process with various tools such as VWAP or the TPO profile you can visit our brand new trading community. 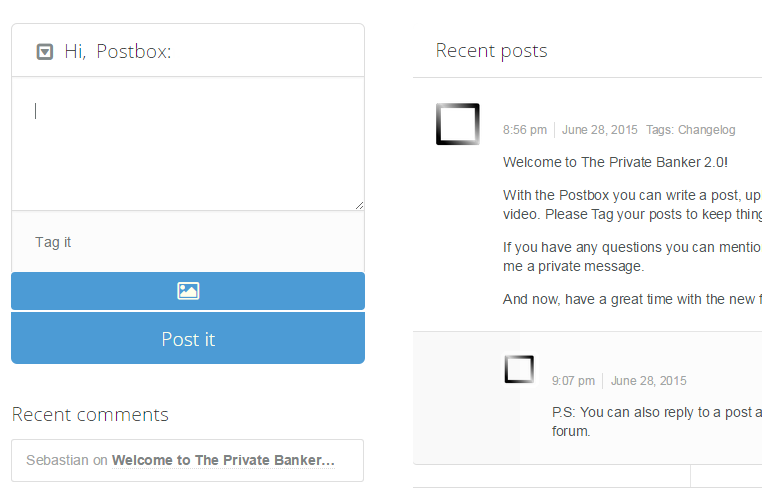 We are extremely excited to announce The Private Banker 2.0 for our trading and investment education community. To better portray our highly sophisticated and advanced approach to trading, we’ve completely reconceived the design and improved the organizational structure of our educational content. In addition we also release a improved way of real-time commuincation for our members. Discover our in-depth multiple step written program that runs along side a substantial video series in a whole new reorganized way. 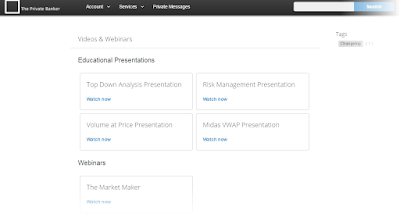 The simplified navigation allowing you to establish a solid base of understanding the markets from an institutional perspective. Identifying trade opportunities whilst effectively managing risk though the use of various analytical tools and structural references. The real-time communication features enables the community to share market observations, upload screenshots and videos as well as to read updates from other like-minded traders in an exciting interactive live environment in order to develop their trading skills. Additionally, Private Bankers are able to use the built-in private messaging service for intern communications within the community. 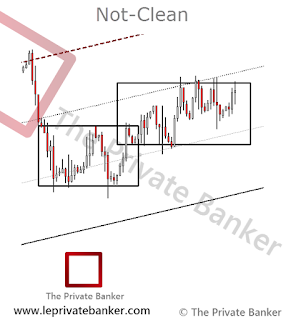 Also our official and regularly updated chart templates are available and presented in a more clear manner. 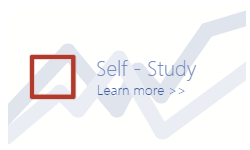 The customisable short-term and long-term chart templates are available to download for all our registered members free of charge. In addition to all this we improved also our membership structure. 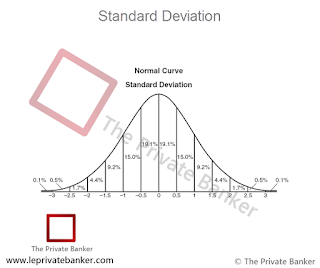 The new Private Banker membership enables you to access all educational content and videos, utilize the realtime communication features, watch the most recent webinars, read educational market reports as well as download the official chart templates for a monthly support of your choice. We do not rest to improve the features and add more valueable functions for the benefit of our trading education community. Also, new educational presentations and webinars are coming soon. With all that said, we looking forward to see you on the newThe Private Banker 2.0. Be part of the unity! 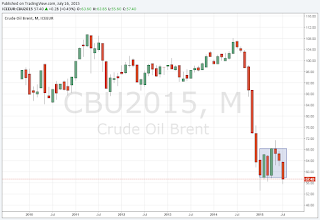 Let's take a look into the WTI Crude Oil (spot price) market. 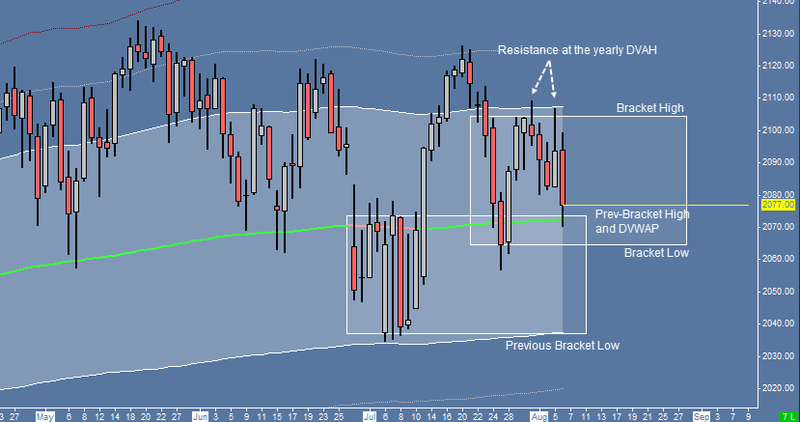 As usual, we start out with the higher time frame perspective to figure out the path of least resistance. 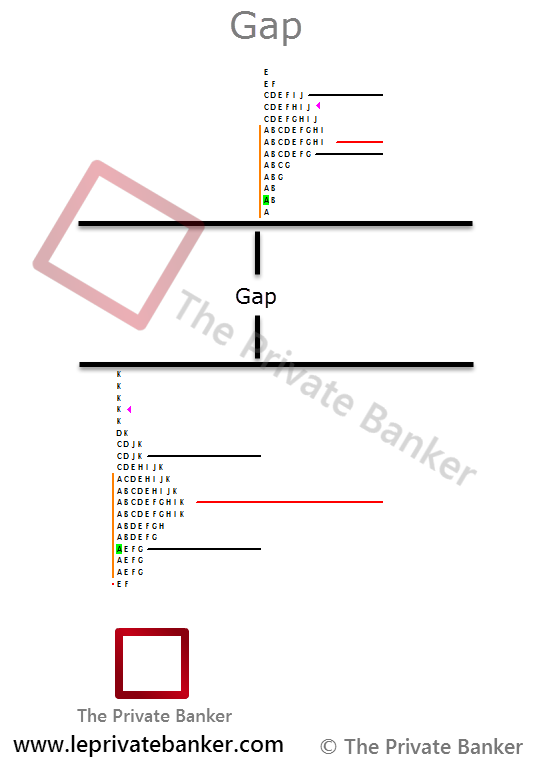 We will also show you the quaterly VWAP in action that we use in our trade methodology next to the monthly, weekly and daily VWAPs. However, firstly we should consider a look with plain candlestick bars starting with the monthly timeframe. 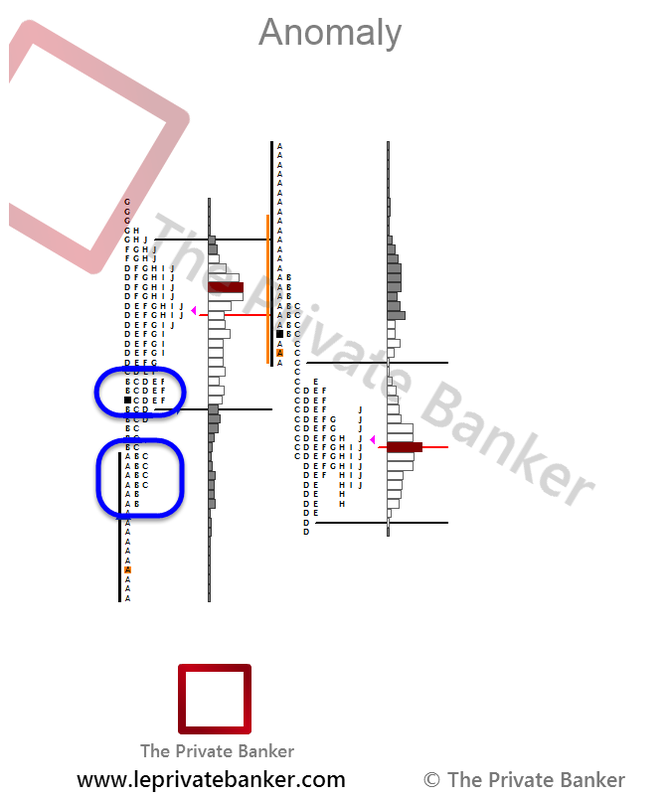 After a heavy one time framing lower market that occured several months the market finally found balance in this area. 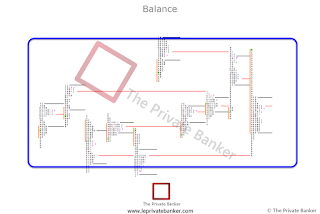 We bracketing around since two months with a current test of the upper balance area. We'll see how the market will react to this level now. 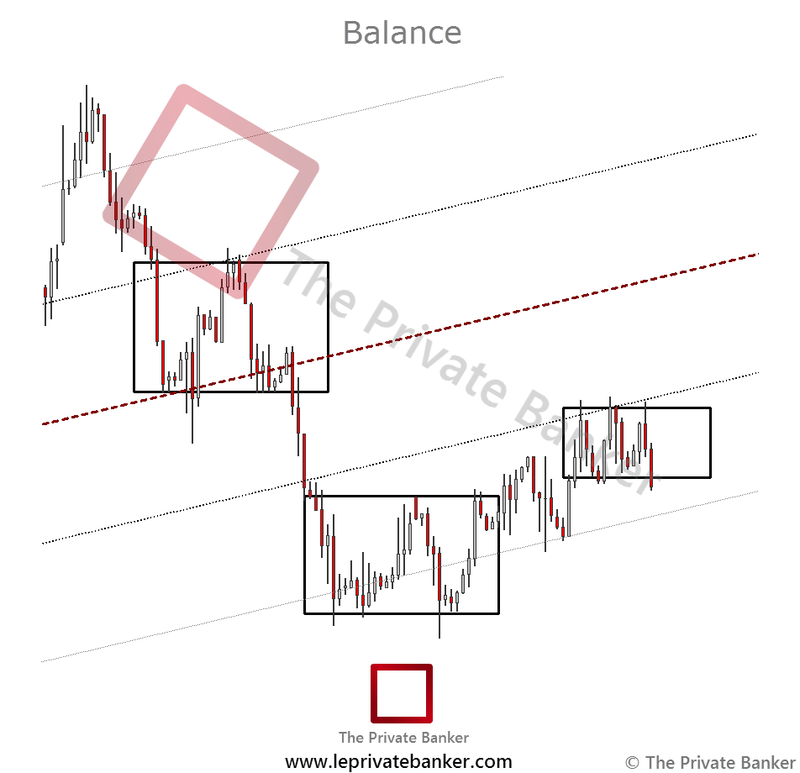 Moving forward to the weekly bars chart, we can observe a one time framing higher behavior since three weeks inside of a clear balance area. Currently the market testing the high of this bracket area. It will be iteresting to see what will happen here. 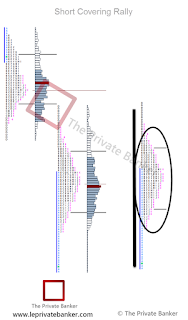 Will we see rejection or a continuation of the upside movement to test some higher prices? Amazing, which one should we use now? For intra-day traders the very right one would be the best choice as it is the current futures May contract price. For long-term traders the spot price feed would be better as of holding positions for several weeks or months. 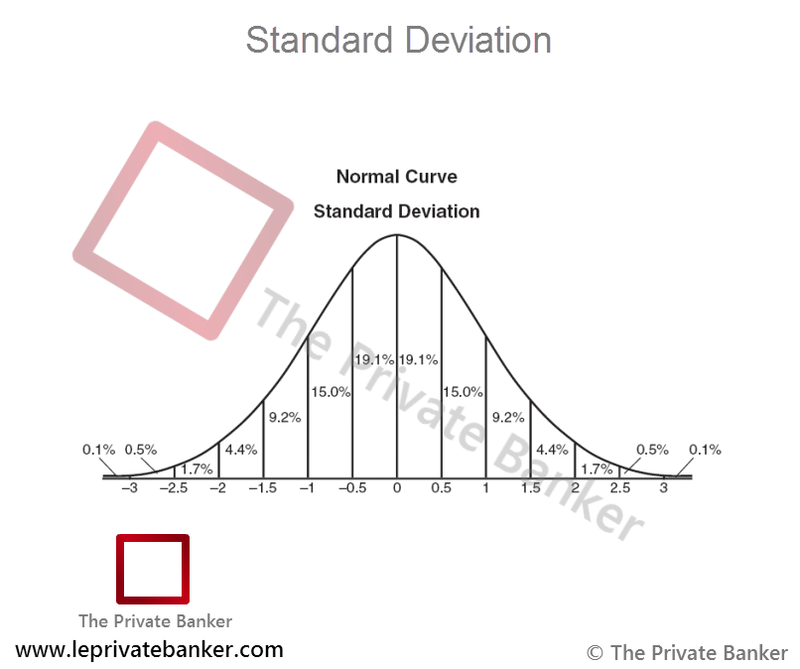 However, there are a lot of options like continuous or back-adjusted charts and whatever more but this this is another story for itself as well as the topic about which levels are the very correct ones and which feed is better for the technical analysis purpose... Feel free to discuss this on our trading community anytime. Let's take a quick look with installed EMAs as well. 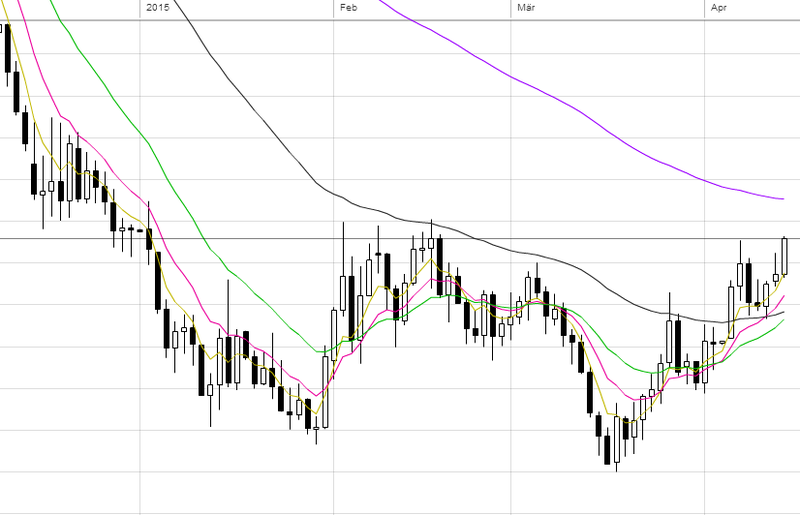 On the weekly chart we can see that the market broke the first two short-term trend EMAs and is on the way to test the third one. 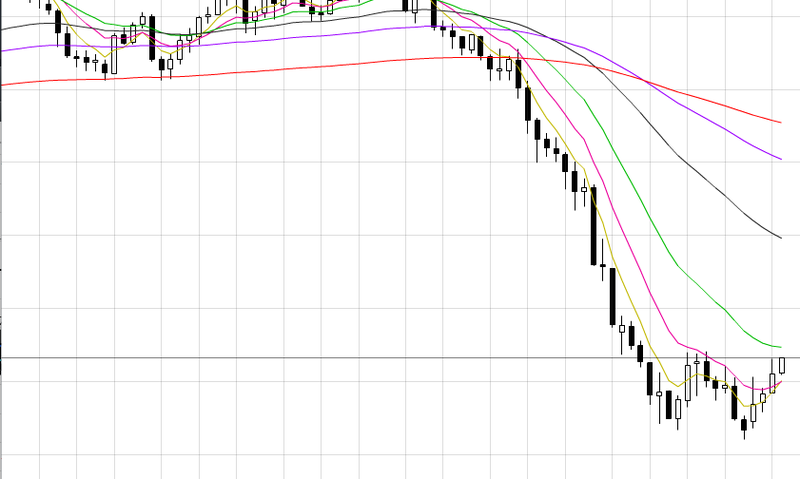 The daily short-term trend is actually intact and with the break of the first longer-term trend 50 EMA it seems the market moving higher to test the 100 EMA. 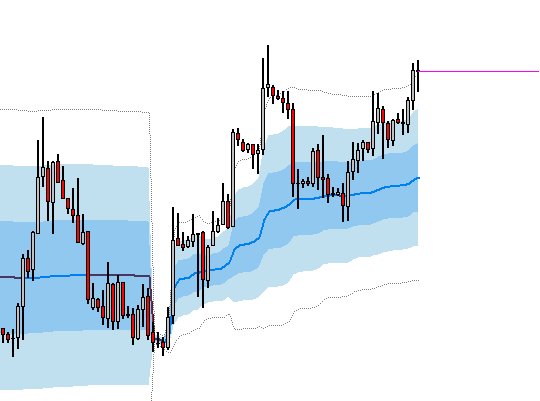 Well, let's moving forward to the Quaterly VWAP. With looking at this chart, we can see the market is trading above the developing value (whole blue area) as well as above the previous VWAP value close area. The VWAP slope of the developing value is also to the upside. 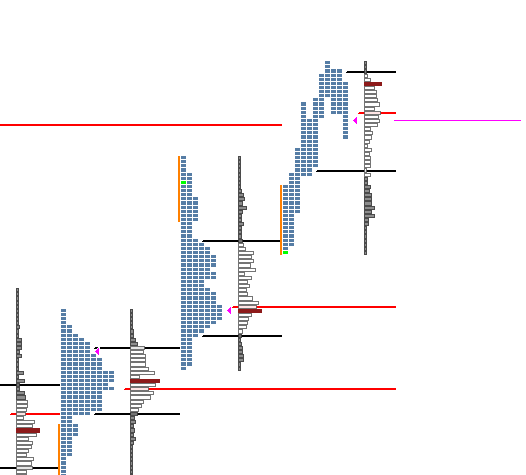 We'll see how the market will react to the mentioned balance area high as this could lead us back to the developing value. Currently it appears we could still test some higher prices as there should be a lot of liquidity above the bracket highs. Here is also a screenshot from the current TPO chart. You can read and learn more about this as well as about our intra-day trading approach on our trading community. 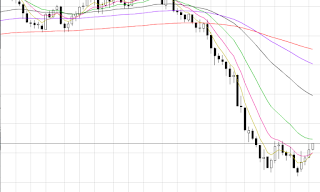 Also, feel free to discuss about our top down technical analysis process. We looking forward to see you there!